The 2019 edition will be released in April. The State Edition lists Members by state delegation starting with the Governor, Senators and then Congressmen. The Alpha Edition lists each Member by last name. Details: Full-color interior with glossy cover. Spiral bound. If your order is over 100 units we can create customized handbooks. Whether it's for a grassroots fly-in or legislative day, a corporate gift, a membership incentive, or company premium we will help you add your logo, custom insert pages, and more when you personalize your order with us. 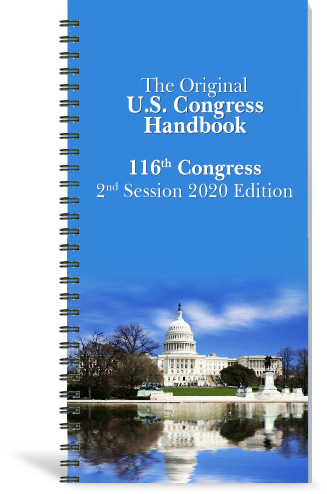 For 45 years the Original U.S. Congress Handbook has been the go-to-resource for members of Congress, thousands of Congressional staff and advocacy organizations nation-wide. 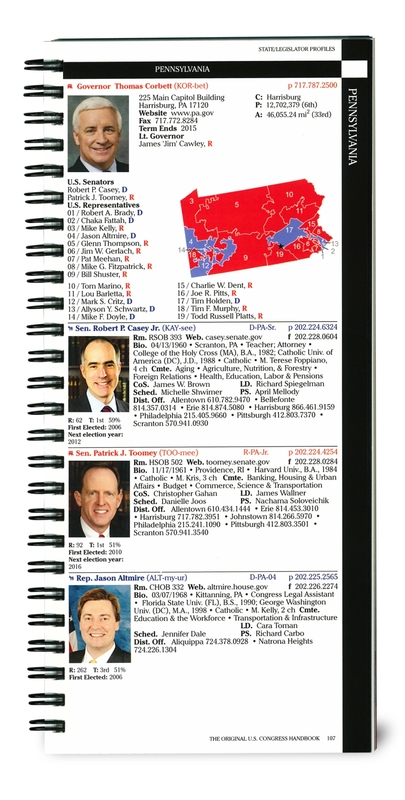 The Congressional Edition of the Handbook has a print circulation of over 4,000 -- with significant circulation to Capitol Hill, the Executive Branch, the Supreme Court and the Pentagon. It is read by opinion leaders and decision makers, including Congressional offices, key federal departments & agencies, association executives, lobbyists and corporate leaders. Why advertise your issue for a day or two when you could get advertising traction all year long? Copyright © 2019 - The Original US Congress Handbook, a division of CBIS. All Rights Reserved.